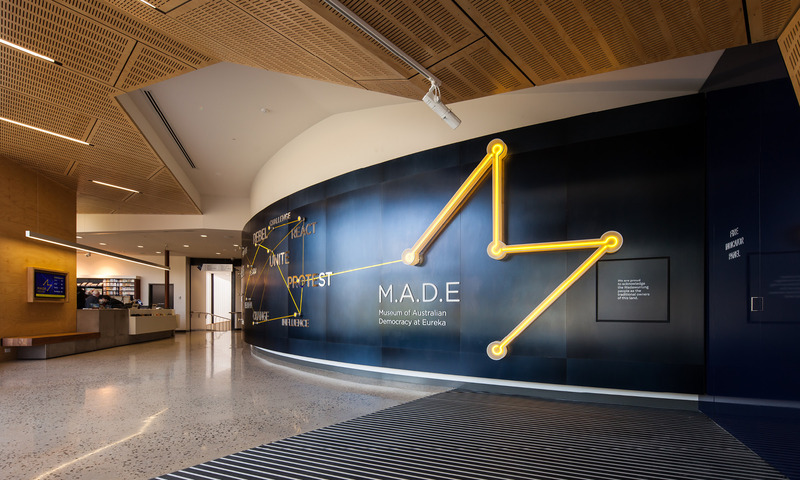 The Museum of Australian Democracy at Eureka focuses on democracy and what it means for the individual, using the events of the Eureka Stockade as its starting point. Thylacine designed a series of dynamic gallery spaces, engaging the visitor with objects, interactives and displays. This serves to provoke the visitor, and enhance their sense of the meaning of democracy. Examples of demonstrations, famous speeches and the experience of powerlessness immerse the visitor, inspiring and instructing them about the power of people. Thylacine worked closely with the project managers, builders, curators and other consultants on this project to ensure an exciting and memorable outcome. Our role encompassed interpretive design and design management, select fabrication and installation. Project partners included multimedia designers Mental Media and lighting designers Bluebottle.